The complexity of the Western Barents Sea necessitates the use of all available geological and geophysical data when undertaking regional interpretations, play fairway assessments and prospect definition. Seismic and 3D CSEM profile across the the Bjørnøyrenna Basin and the Skrugard discovery well 7219/8-1 S. Notice the excellent match between the structural information provided by the seismic section and the resistivity profile with a conductive Tertiary resting on top of a resistive Cretaceous-Jurassic fault block with the Skrugard discovery well 7219/8-1 S. As the downthrown block is conductive, a better understanding of such resistivity variations is an additional key for breaking the basin code. Source: Aker Geo Several recent oil and gas discoveries in the Western Barents Sea are now triggering an increased interest in this huge, largely unexplored petroleum province far beyond the Arctic Circle. First, Statoil announced an oil and gas discovery with well 7220/8-1 – Skrugard – on April Fool’s Day, in the Bjørnøyrenna Basin. It contains at least 250 MMboe, maybe up to 500 MMboe, within Jurassic sandstones. A 33m gas column and a 90m oil column were encountered (GEO ExPro Vol. 8, No. 3). Later, during late spring, Total drilled 7225/3-1 – Norvarg – far north on the Bjarmeland Platform. The well proved gas in three different layers within the Triassic. It has not been finished yet, but rumours say it may be a significant discovery. Then Lundin Norway made another gas discovery in July with well 7120/2-3S - Skalle – further to the south, on the southern flank of the Loppa High, and only 25 km north of the producing Snøhvit field, in the Hammerfest Basin. The well proved gas in three separate zones with a total column of 95m in Jurassic and Cretaceous sandstones. The gas field Snøhvit has been producing since 2007 (1 Bboe recoverable gas and condensate), while the oil field Goliat (220 MMboe) is under development and is expected to start flowing in 2013. “This follows 30 years of meagre results with only two commercial discoveries, in spite of close to 90 exploration and appraisal wells and hydrocarbons shows all around,” says Bengt Larssen, President, Exploration with Aker Geo. Perspective view of the Base Cretaceous in the western Barents Sea. In yellow, the highlighted area shown on the expanded figure. Source: Aker Geo Bjørnøyrenna Basin with the Skrugard discovery. 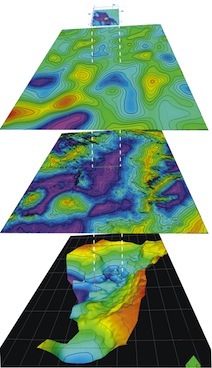 Seismic structural map, Base Cretaceous (bottom) with the magnetic tilt derivative map, reduced to the pole, High Pass filter 15 km, gravity free air anomaly map, HP filter 15 km (middle) and (top) 3D CSEM (Controlled-Source Electromagnetics with a towed dipole transmitter and arrays of sea bottom dipole receivers) anomaly map showing a strong salt induced resistive anomaly close to sea bottom (cross section on page 56). The structural trend in the CSEM map corresponds to an offset in basin overall NNE-SSW trend. Source: Aker Geo “It is well known within the Norwegian petroleum community that the Skrugard prospect is associated with a prominent flatspot. It has now also been confirmed by EMGS that the rumoured electromagnetic anomaly actually exists and has been used in de-risking the prospect. It is thus no big surprise that the structure contained hydrocarbons. The uncertainty was the type of hydrocarbons and volumes,” he adds. According to Larssen, the seismic data also shows widespread gas leakages in this area, meaning that there are – beyond any doubt – hydrocarbons in the system. The question is no longer “if”, but “where” and “how much”. “The area needs to be better understood in order to unlock the values, both in terms of new play fairways and accumulations of hydrocarbons. One way of doing so is to use all available geological and geophysical information in an integrated study”, Larssen claims. The western half of the Barents Sea is considered very challenging. It is characterized by few wells (80 boreholes over 160,000 km2, an area equivalent to the entire North Sea) and a variable quality of the seismic data, together with several highly tectonized basins and a complex uplift history. Recent 2D and 3D seismic surveys, with state of the art processing, do however effectively improve the quality of the seismic. Satellite gravity and airborne magnetic data supplement the seismic and geological data and serve to increase the overall understanding of the structural and basin development. In recent years, other geophysical data sets have penetrated the market, including Controlled Source ElectroMagnetics (CSEM) and Magnetotellurics (MT). The CSEM data is now extensively used by some companies to de-risk their prospects ahead of their license applications or drilling, while MT is still in its infancy offshore. “We consider it very important that all these data sets should be an integral part of a regional assessment”, says Guy de Caprona, senior geologist with Aker Geo. “During the last decade Aker Geo has conducted comprehensive regional hydrocarbon potential studies on the Norwegian continental shelf, utilising mostly public domain data. The success of these reports has to do with integrating all available data resulting in the identification of play fairways,” adds Larssen. The company, based in Oslo and Stavanger, has – very timely – just finalised the most recent study in the Barents Sea, using all kinds of geological and geophysical information in addition to seismic and well data. 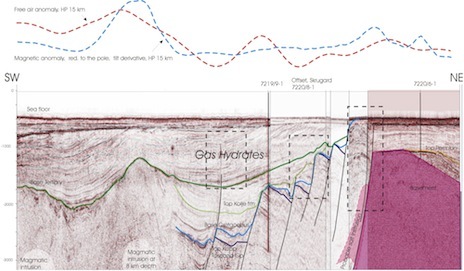 “The results are very promising,” says Caprona, referring to the fact that gravmag and MT improve the understanding of structural and basin development, as the depth of imaging of these tools goes well beyond seismic. Gravity and EM help identify subtle structural features such as salt induced structures, while gravmag data anomalies also pinpoint highs of possible magmatic origin. 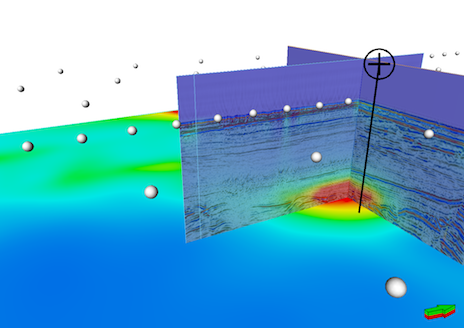 Seismic section and an inverted 2D MT profile (preliminary result): the resistive body in the center of the basin with low density is interpreted as a salt diapir. The naturally occurring electromagnetic field in the earth subsurface (magnetic field and its variations inducing electric or telluric fields) is recorded with the same dipole receivers as for CSEM data and at the same time. Beyond the depth of the seismic profile, not shown here, the MT data show an extensive, thick and highly resistive body interpreted as Carboniferous salt. Source: Aker Geo Source: Aker Geo Composite seismic line with gravity and magnetic profiles, with inserts, across the Loppa High and the Bjørnøyrenna Basin. The gravity data show that deep Carboniferous salt, identified on MT data, has used the Loppa High western bounding faults as migration conduit. A correct imaging of the geometry of the salt bodies is quintessential for the understanding of the plays. In this basin, the imaging capacity of seismic does not go beyond the Middle Jurassic. Source: Aker Geo The western Barents Sea includes a number of different basins with their own unique petroleum systems and plays. Up to now, only two plays have been confirmed, but with the three recent discoveries this number will certainly increase. These recent discoveries will of great help to” break the code” and understand the petroleum systems of areas west of the Loppa High and, applying an integrated approach, to piece together the puzzle of hydrocarbon systems of the Barents Sea in general. What does 30,000km2 of seismic data from offshore western Ireland tell us about the hydrocarbon prospectivity and drilling potential of the Porcupine Basin? What exactly are unconventional resources - and is it time we stopped using the term?